As many regular holidaymakers to the area will no doubt be aware, a Byron Bay festival is always a given regardless of the time of year. From the Old and Gold Festival next month (a favourite of those who enjoy a good old rummage amongst antiques and crockery) to the yummy Sample Food Festival in September and October’s fabulous musical Boomerang Festival in October, it’s all happening down New South Wales way we think you’ll agree. The line-up of activities is such that you’d be hard-pressed to not find something you, your family members or friends would be interested in. The challenge is deciding whose interests to put centre stage – or maybe you can visit more than once? This is an absolute must for those who love nothing more than to spend the day sifting through a pile of discarded and second hand items. That doesn’t exactly make it sound very exciting when written down but if you’re a fan of recycling and vintage art/crockery/furniture then you’ll know exactly why we get really enthusiastic about this particular event. And we’re not the only ones either. Last year around 6,000 visitors turned up to Brunswick Heads in Byron Bay for the Old and Gold Festival – and all on the one day! It goes without saying then, in order to pick up the best bargains – and get anywhere near your favourite stalls for that matter – then turn up early. It all kicks off at 8.30am and continues right through well into the evening. As well as the All Town Garage Sale there are four massive second hand fairs and the odd competition for the antique and vintage obsessive. We all know how kids hate to trail around the shops so, if you’re bringing little ones along don’t worry about their limited attention spans and possible tantrums. That’s because there’s a sing-a-long (starting 10am), face painting, craft making at Into the Woods near St Thomas’ Chuch on Fingal Street, and the popular Fairbrooke Horse and Carriage ride (departing from the Memorial Hall). Literally light up your winter at the weekend of June 21 by taking part in the Lismore Lantern Parade. This is the 20th year of the popular two day get together, timed to hit the longest night of the year – the Winter Solstice. More of a community arts festival than merely a parade, the event which acknowledges the customs of the aboriginal Widjabul people, comprises street theatre, music, dancers, puppets, workshops, pyrotechnics, lantern making (in the weeks running up to the Byron Bay festival weekend) and the odd market or two. As you can imagine from the line-up we’ve just described, this is very much a family-focused affair but the bands and fire art appeals to a young crowd too. This year organisers are predicting around 60,000 people will turn up for this Byron Bay festival. Will you be one of them? Our own personal favourite here at Broken Head Holiday Park, the Writer’s Festival has a big star attraction this year – none other than acclaimed English and international writer and author of the best-selling Oranges Are Not The Only Fruit and Sexing the Cherry Jeanette Winterston OBE. She’ll deliver the festival’s keynote address and participate in several Byron Bay festival events throughout the weekend. And she’s good – certainly if the UK’s top-selling Guardian newspaper is to be believed – the daily broadsheet voted her one of the top 10 writers to see live on-stage. Another big coup this year is North American author Poe Ballantine whose latest release Love and Terror on the Howling Plains of Nowhere is based on the true story of a murdered neighbour. In total more than 100 authors will be appearing in Byron Bay that weekend for the Writer’s Festival – and it’s quite a line-up. It includes Malcolm Fraser, Tim Flannery, Clare Wright and Julian Burnside to name just a few. Meanwhile budding young authors should already be thinking about their entry for the Susie Warrick Young Writer’s Award since the closing date is July 2. See the website for entry information. This year’s festival will have an environmental theme with two global eco-warriors – former top man in the Australian Climate Commission Tim Flannery and former parliamentary leader of Australia’s Green Party Bob Brown. Both have recently released books and have had a huge hand in staging the Writer’s Festival in the past. A particularly popular part of the Writer’s Festival each year is the Pitch Perfect platform. This is where five pre-selected budding authors take to the stage and pitch their manuscripts to a team of publishers. It’s already resulted in successful publications making it a dream platform for thousands of authors out there. Submissions for the short list should also be sent in by July 2 to ensure selection. Young kids are catered for too at the festival with the Kids Marquee where there will be an impressive line-up of children’s authors to keep little ones amused and inspired. Meanwhile the complete list of writers appearing is expected to be available from the website at the beginning of June. Following on in popularity from the Writer’s Festival, the Sample Food Festival is a mouth-watering display of some of New South Wales’ top cuisine. Now in its third year, the Byron Bay festival event – in Bangalow – attracts a crowd of 15,000 annually. It’s excellent for sampling dishes you’ve never dared try before – just turn up to the 20 sampling tents open between 8am and 4pm and vote for your favourite nibble to make sure they’re winners in the Golden Fork Award. The day also consists of cooking demos, the odd appearance from a celebrity guest or two and a chance to learn cheese making – amongst other foodie activities. There is also entertainment for the kids and a beer garden for dad. Get there really early and enjoy a farmers’ market breakkie at 8am. Blues devotees should check the dates for the Boomerang Festival held every two years. Based at The Tyagarah Tea Tree Farm, which sits just 11 kilometres north of Byron Bay and eight kilometres south of Brunswick Heads, the biannual festival is a three day Bluesfest with some of the biggest names in the business attending. This includes harmonica impressario Charlie Musselwhite, Aaron Neville, Beth Hart, Boz Scaggs, Booker T Jones and The Dave Matthews Band. Surfing is definitely a sport but it’s all about the creativity here at the three day Byron Bay Surf Festival which celebrates film making, photography, surfing art and the development of handmade surfboards – as well as some serious board boasting. Oh, and there’ll also be some live music (think 70s grunge). Now in it’s third year, this “must attend” event for any serious surfer in New South Wales has reserved a popular annual spot in Byron Bay’s festival calendar. One of the undoubted highlights this year is the new Torpedo People event at Wategos Beach and which will feature 10 of the top gliders who can choose flippers, surf mats or even just their hands in this competition. Pro-surfers include the likes of Belinda Baggs, Tom Wegener and Dave Rastovich. Hosted by Keith Malloy (of Patagonia fame and author of The Plight of the Torpedo People), winners will receive some much coveted Patagonia products at the prize presentation and closing ceremony in the Beach Hotel from 5pm. What is the Latin Fiesta? Well, as you’d expect there’s a lot of dance and intoxicating music happening at this four night and three day event and which is now in it’s ninth successul year. Billed as one of the best Latin dance events in Australia, it attracts beginners and professionals alike. International performers strut their stuff while local novices also get a chance to take to the stage. The official launch party for this Byron Bay latin dance festival is at 8pm on Oct 31, following the first workshop of the event at 7pm. Buy tickets for both from the website today and where you’ll also find details of other up and coming related events. Organiser’s describe the dancing, music and partying as a blend and coming together of native Indian, African and Spanish cultures from a grass roots perspective. If you’ve ever fancied learning Latin dance or just enjoy listening to those fun and lively sounds then this Byron Bay festival is the place to be come the first weekend in November. Comprising 120 events over four days and in 12 different venues, the http://www.mullummusicfestival.com/ is no mean feat to organise. But guess what – it always goes smoothly (apart from the first time when there was an electrical storm and three roads into Byron Bay were closed off) and is a major attraction to the Byron Bay festival calendar for the past six years. Events at the Mullum Byron Music Festival include lots of free concerts at the Mullum Growers Markets and the Civic Hall, a Sunday street parade to the Civic Hall and beginning at the Council Chambers, strees theatre and music from local artists. The Magic Bay and Big Red Bus means it’s easy to hop from event to event and to ensure you don’t miss anything. A Saturday morning music workshop is always popular while for those who feel the need of exercise or relaxation there’s always a yoga class or two going on. Creatives should also look out for the Play Mullum song writing competition. Who knows the next Kylie may be waiting in the wings? And finally, to round off 2014 there’s also the opportunity to enhance the Christmas spirit by taking part in the Bangalow Christmas Eve Festival. Held in the town’s Main Street from 5 to 9pm, it’s a real family event and features lots of yummy eats, street performances, face painting, bands and even puppet shows. Oh, and we dare say there will be a visit from a certain Mr Claus. So, as you can see from the above selection, there is certainly plenty of goings on in terms of Byron Bay festivals for the rest of this year. To make sure you don’t end up having to rush home and miss out on your favourite attractions why not stay the night or weekend here at a beach cabin or a beach camp site at Broken Head? 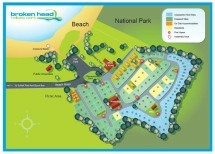 Certainly we have lots of accommodation at Broken Head Holiday Park but it’s always better to book in advance. In fact, we would always recommend booking at the same time you get your Byron Bay festival tickets. No-one wants to spend the night in the car after all!